“Hot dog, hot dog, hot diggety dog—now we got ears, it’s time for cheers! If that little song doesn’t get you in the mood for Disney and hot dogs, I’m not sure what will! One of Mickey’s catch phrases is “Hot dog!” and if you’ll be visiting the main Mouse’s stomping grounds at the Walt Disney World Resort in Florida soon, and you love hot dogs, then you’ve got to try these 10 fabulous frankfurters! If you’re a lover of Mediterranean fare, you’ll find this hot dog both interesting and delicious! It’s an all-beef dog topped with a generous portion of Gyro meat, Tzatziki sauce, cucumber, tomato and feta cheese. It’s an interesting take on the hot dog, and you’ll love the Mediterranean flair! See for yourself! At Casey’s Corner on Main Street U.S.A., Guests can try different ginormous versions of dogs. The Aztec combines a sweet and smoky ground beef, roasted corn salsa and parmesan cheese, all atop an all-beef dog. It’s differently delicious! At Echo Lake at Disney’s Hollywood Studios, you can visit the Dockside Diner and order the Carolina Foot-long Dog. It’s a dog topped with pulled pork and coleslaw. It’s a twist on a hot dog and the pulled pork sandwich. Hey—you’re used to eating coleslaw on the side of your dogs and sandwiches—why not pile it all on top of the dog to begin with? Swimming, splashing and water-sliding can make you hungry! So the next time you visit Disney’s Blizzard Beach water park, be sure to step up to the window at Avalunch and order the Barbecue Slaw Dog. It’s a beef hot dog topped with steamy hot barbecue and coleslaw—a little like the Carolina at the Dockside Diner, but it’s not identical in taste. They’re both yummy and you can only get this one at Blizzard Beach. At Casey’s Corner on Main Street U.S.A., they serve up huge hot dogs, and they serve them up differently! This dog is no exception! An all-beef dog is topped with macaroni and cheese which isn’t really too far out, if you consider that many people eat hot dogs with a side of mac-n-cheese. Casey’s just made it easy by combining the whole meal onto one dog! Casey’s kicks it up a notch further by topping the mac-n-cheese with bacon, and who doesn’t love bacon?? 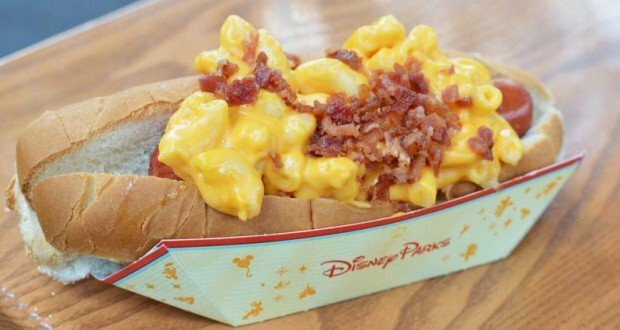 Along Sunset Boulevard at Disney’s Hollywood Studios, you can order one of the best dogs at Disney World—but it’s not some new concoction you’ve never heard of. Rather, it’s simply one of the best chili dogs in the parks. At Fairfax Fare, you can order the Chili-Cheese Footlong. It’s simple—an all-beef dog topped with spicy chili and cheese sauce, served with chips. You don’t get much more American than that! If you love Cuban food, raise your hand! At Disney Springs, you can enjoy great Cuban food at Bongo’s, but if you like your Cuban and your dogs, why not combine the two experiences? And because it’s Disney World, you can! This dog is topped with Mojo pork, sweet pickle relish, mustard and swiss cheese. Think of it as a Cuban sandwich-dog! You’ll huff and you’ll puff and you’ll blow the house down when you stop in at B. B. Wolf’s at Disney Springs and try this little number! The 3 Little Pigs Trio comes with an Italian dog, a Latin dog and a Greek dog, all mini-sized. We told you about the Greek dog already—the Latin dog is topped with queso fundido, Havana-style corn salsa and chipotle mayo. The Italian dog is topped with peppers, onions and marinara sauce. This entrée is great because you can try a little of each dog and decide which one you like best! Ok, so these are corn dogs, not hot dogs, but Guests go crazy for them. You can find them on the appetizer menu at Paddlefish at Disney Springs. The dogs have a corn meal batter and a dipping sauce (sweet chili aioli) that’s spicy but not too spicy. And as appetizers go, this one is a generous portion. If you’re not super hungry, you could totally make a meal of just these dogs. And last, but not least, we want to make mention of the To-Go Cart at Disney’s Boardwalk where you can choose from more than one hot-diggity option. No crazy toppings here, but it’s cool that you can order a footlong corn dog basket, in addition to the corn dog basket, hot dog basket and footlong hot dog basket. Each basket comes with fries and a fountain drink, so take your pick!